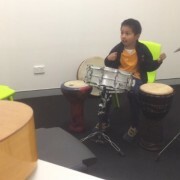 How do MUSIC THERAPISTS use music to develop COMMUNICATION SKILLS in children? 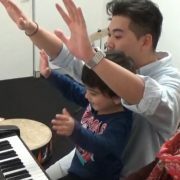 This video gives you an insight into how music therapists utilise musical interventions to achieve developmental goals. We have had an amazing, very busy year at Sound Expression – thank you to our wonderful team and all the families who have entrusted us with your children. Here’s a little something from us – sharing the children’s joys and achievements throughout 2016! 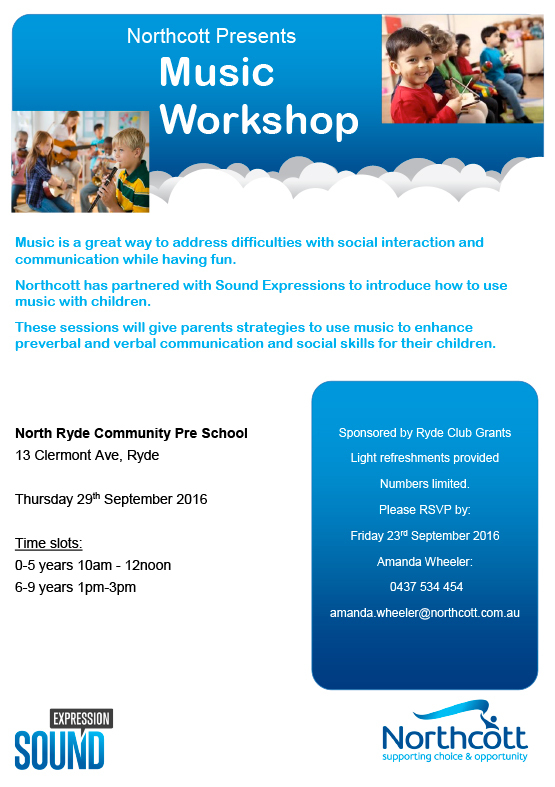 In partnership with Northcott, Sound Expression will conduct another music workshop for children with special needs and their parents in January 2017. 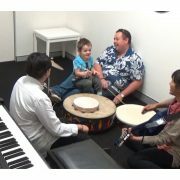 Music is a fantastic way to support children who struggle with communication and in social settings. 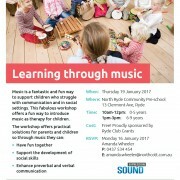 This fabulous workshop offers a fun way to introduce music as therapy for children. 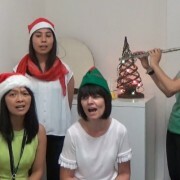 Need a simple musical arrangement for Christmas? Here’s a simple arrangement for Silver Bells – all you need are 6 bells! 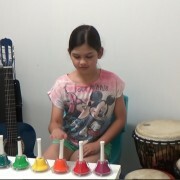 Great to use for your music therapy groups, community music groups, Christmas performance at your school or preschool. Watch Alex as he learns to play the chords to Bob Marley’s Three Little Birds on the piano! 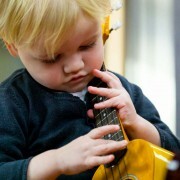 Alex is a young boy with autism who has an innate talent for music. Recently he has been learning how to play chords on the piano. Here’s a little snippet of him playing Three Little Birds. Meet Daniel! Daniel is a 3 year old boy with autism. He is learning the skills needed to engage and communicate with others. Here’s his journey so far. 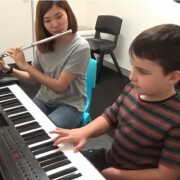 https://soundexpression.com.au/wp-content/uploads/2016/10/AA-learning-to-engage-pic.jpg 504 559 --ed1t-OR1-- https://soundexpression.com.au/wp-content/uploads/2015/07/logo-sound-expression.png --ed1t-OR1--2016-10-25 11:14:212016-11-11 14:05:40Awesome Achievements Series - "Learning to Engage"
Meet Dre! Dre is a young boy with autism who loves being immersed in music but he finds it difficult to control his impulses. His music therapist Pete is helping Dre to control his impulses while still nurturing his love for musical freedom. https://soundexpression.com.au/wp-content/uploads/2016/09/Pic-for-AA-regulating-my-impulses.jpg 553 694 --ed1t-OR1-- https://soundexpression.com.au/wp-content/uploads/2015/07/logo-sound-expression.png --ed1t-OR1--2016-09-17 09:27:482016-11-10 09:42:35Awesome Achievements Series - "Regulating my impulses!" Music is a great way to address difficulties with social interaction and communication while having fun. 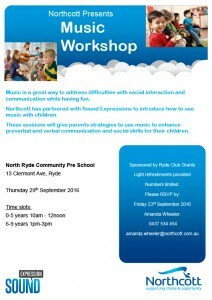 Northcott has partnered with Sound Expression to introduce how to use music with children. These sessions will give parents strategies to use music to enhance pre-verbal and verbal communication and social skills for their children.